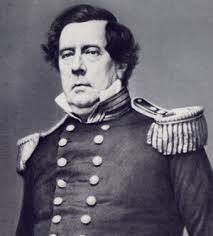 On this day in 1853, Japan took the initial steps to join the community of nations when US Commodore Matthew Perry, representing the US government, sailed into Tokyo Bay. After due consideration, Japanese officials accepted letters from President Millard Fillmore, making the United States the first Western nation to establish relations with Japan since it had been declared closed to foreigners two centuries before. This opening led to the 1854 Treaty of Kanagawa between the US and Japan, opening the ports of Shimoda and Hakodate to American trade and permitting the establishment of a U.S. consulate in Japan. Then in April 1860, the first Japanese diplomats to visit a foreign power in over 200 years reached Washington, D.C. These steps led to other treaties with additional Western powers, contributing to the collapse of the shogunate and ultimately the modernization of Japan. This opening led to the integration of Japan into the world economic order. The integration of compliance into the fabric of any company is the ultimate goal of every Chief Compliance Officer (CCO) and compliance practitioner. The disconnect between the written anti-corruption compliance program and the doing of compliance is one of the chief forces which can lead to violations of laws such as the Foreign Corrupt Practices Act (FCPA) and UK Bribery Act. This disconnect can lead to conflicting messages and conflicting objectives within any organization. However if a company can amalgamate compliance into its DNA there is significant opportunity for both efficiency and value creation. I thought about these issues when I read a recent article in the Summer 2015 issue of the MIT Sloan Management Review, entitled “Integrating Supply and Demand”, by Wendy L. Tate, Diane Mollenkopf, Theodore Stank and Andrea Lago Da Silva. While their focus was geared toward the integration of sales activities to operational activities in an organization, I found the discussion useful for the CCO or compliance practitioner. I have taken some of their key concepts and adapted them for the compliance function. Their starting point is appropriately with Peter Drucker who noted that the disconnect between the sales function and the supply chain was one of the “great divides” in management. Unfortunately the same can often be said for compliance and business operations. Many companies are “still trying to play off three sheets of music – the financial plan, the marketing plan and the operations plan – with results that seldom end in three-part harmony.” You can certainly slot compliance into this more than occasionally off-key harmony. The question is how can compliance integrate into these functions to become part of the overall business proposition? The authors posit that companies that have only a single initiative toward integration are doomed to failure. To me that sounds quite a bit like the difference in having a paper compliance program in place and actually doing compliance. The authors identified five steps that they have observed successful companies coalesce these functions together. Develop a relevant value focus. Senior leaders must set a tome on creating value for the organization through compliance. But this means more than simply lip-service, as achieving this goal typically requires developing cross-functional structures and installing dashboard metrics that keep the business focused on implementing cross-functional integration. Share knowledge across the organization. Managers must work on building inter-functional collaboration within the company, building external collaboration with supply chain partners and adopting technology that facilitates collaboration. This means more than simply training. Compliance practitioners need to be able to provide day-to-day guidance on how to do business in compliance with the company’s articulated standard. Allocate resources strategically. Once the entire organization shares the same set of facts, the company can then begin to make more thoughtful analysis of where and where not to allocate resources based on which customers deserve priority. Executives in sales and marketing should meet with the CCO or compliance practitioners to make decisions about how to create and fulfill demand for the business. This is where a risk assessment can move to a proactive document which can be a road map to not only enhance the compliance program but to strategically allocate compliance resources in a more agile manner. Learn to walk the talk. Executives at this stage make individuals accountable not just for their own compliance performance but for the overall compliance performance of the organization. This should empower business unit representatives to make decisions that maximize overall value and develop new education and training systems that encourage collaboration all within the context of doing compliance. Finally, they develop new incentive systems that encourage employees to stay focused on how to provide sustainable value to the strategic use of compliance. To facilitate this integration, the authors present what they term as three key insights for managers. Once again, while the article is focused on supply and demand integration, I found their insights applicable to compliance integration as well. The first is that integrated knowledge is needed to guide integrated decisions. This means there must be collaboration across a wide range of constituencies and stakeholders. In addition to those groups within an organization, it also includes third parties in both sales and supply chain. Second, pursuit of relevant values requires making choices. This means that your decisions must be based on verifiable data, otherwise you simply have internal battles solely based on anecdotal evidence.